4/6/ and 4/7/2013, Irvine, CA, book signing, Seoul Selection/USA. (Two feature articles, Orange County Register and announcements by Korea Herald, 한국일보, JungangIlbo). 4/17, Arrowhead Middle School, Kansas City, Kansas. Reading/Talk to an audience of 300 middle school students and 35 teachers. I signed books for the teachers. 4/18, Ft. Collins High School. The posting about my three readings/presentations to 10th graders with pictures appeared at www.writingforpeace.com (4/25/2013). 4/20, author visit to Beitel Elementary School, Laramie, Wyoming. 4/30, Reading, KU, 4pm, Pine Room, Kansas Union, Lawrence, KS. 5/3, Author visit at Underwood Elementary School, Lee’s Summit, MO. 5/20, Reading/Talk, middle school assembly, Seoul International School, Seoul, Korea. 5/22 (?) (Date to be announced), Publication announcement, press conference, reading, Seoul Selection Publishing, Seoul, Korea. 6/22, Give a speech about my personal experience of the Korean War and how my novel relates to the war and the Armistice Agreement, the Korean War Museum, Springfield, IL. Author visit/book signing at a library and/or book clubs in Springfield, IL, TBA. 6/26-28, Book signing, Washington, D.C., organized by Sogang alums and the Korean Association. 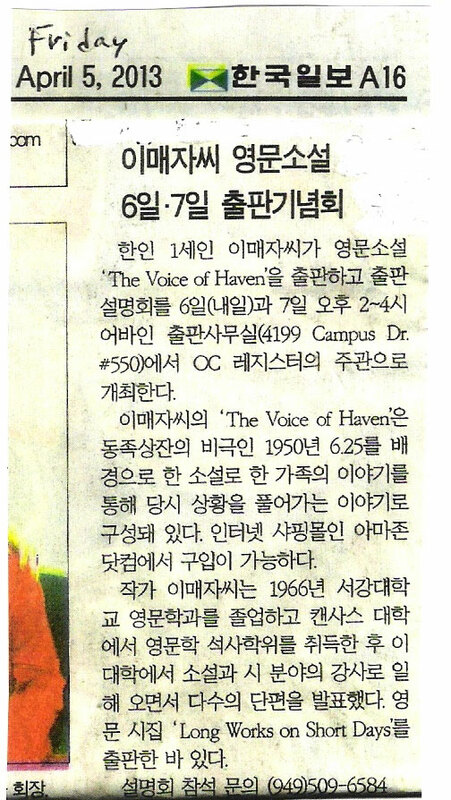 7/24, Book giveaway/signing, The Voices of Heaven, a novel about the Korean War, 5:30-7:30 pm, The HUB, 220 2nd Ave. S., Seattle, WA 98104. Open to the public. 7/29, Presentation at The Horizon House, 900 University Street, Seattle, WA. Residents and invitees only. 10/27, Reading/presentation Haechi in Myongdong, 10 Magazine Book Club in Central Seoul. Contact: Barry Welsh, host/organizer, barrywelsh23@gmail.com, 010-5138-8859, www.gbdigest.com. 5/20/2014, Reading, 7 pm, Johnson Country Community Resources Library, Kansas City, KS, contact: Jeanie Wilson, jwilson102@kc.rr.com. 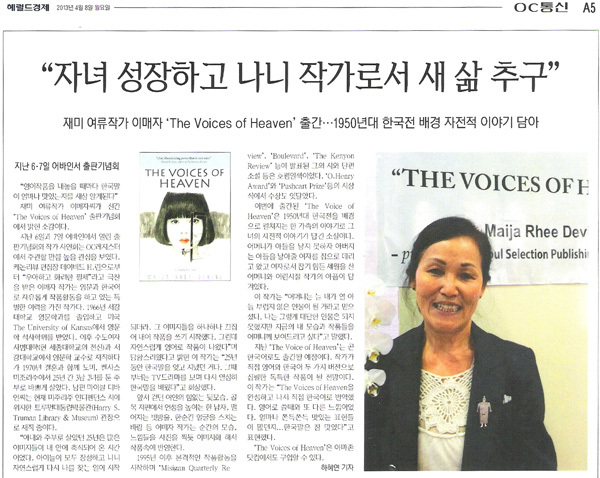 In “The Voices of Heaven”, Maija (pronounced May-jah) Rhee Devine tells the story of a young Korean couple in the early 1940s with a love for each other “as sweet as sticky rice,” according to the author’s description. Their relationship and country are tested, though, as the pressure to give birth to a male heir mounts and a divided Korea goes to war. Devine also tackles gender roles in a traditional Confucianism system that values men above women. Much of the fictional novel is inspired by her own life. Devine will be signing her novel today and Sunday from 2 to 4 p.m. at her publisher’s office at 4199 Campus Drive, Suite 550 in Irvine. The book is being published by Seoul Selection Publishing and is available on Amazon.com. Q. A lot of noise has been coming out of North Korea lately – what do you think of the latest threats (i.e., the end to the armistice with South Korea and talk of reviving a nuclear program)? Q. What was it like tackling your first novel? A. Actually, I used a lot of autobiographical material. The first book was a memoir. I had an agent who read the memoir manuscript and she recommended that I turn it into a novel. … So I wrote it all over, in a novel form, which took a little over 10 years to do that. I needed to learn how to do it. I didn’t know the craft. It took awhile. In the meantime, I did publish short stories and poems. … I would have given it up long ago, if it wasn’t for believing that these common people I write about in my novel, if I didn’t write about them, they would be lost forever to the world. Nobody would know them. They would just live their lives struggling, loving, doing whatever was necessary under the Confucius value system, and they die and they’re gone and I wanted to honor them. Q. How much of the autobiographical material from your earlier memoir remains in your novel? Q. The daughter character, then, I’m presuming is based on you? A. The daughter does not know that she was adopted right at the beginning of the book. The adults talk about her being an adopted child but she does not know. She blames herself that her parents are going through this tragedy, brokenhearted over the mistress coming, because of this daughter. If she had been a boy, this would not have happened. Only in the epilogue of the novel, when she is a grown woman, she learns that she’s adopted. Q. What ultimately do you hope readers will take away from your book? A. I would like them to know this book as a story of common Korean people going through their struggles with not only their personal lives but with national disaster and know that what they try to do was to live up to Confucian values, which means honoring other people, women honoring men. That’s the main theme of this novel. Within the Confucian value system, women were below men. Although that changed a lot the last three or four decades, the male-centric value still continues. … They made this huge economic leap from third world. … But where are the women? They are still lagging behind. Contact the writer: Maija Rhee Devine graduated from Sogang University in Seoul and earned a master’s degree from St. Louis University in Missouri. She has taught English as a second language at colleges and universities, as well as Asian Civilization courses at the University of Kansas. Her husband Michael J. Devine is the director of the Harry S. Truman Presidential Library. IRVINE – A group of Korean Americans and Koreans gathered Sunday afternoon to discuss a new book about the Korean War and to exchange views on the escalating tensions between North Korea, South Korea and the U.S. Maija Rhee Devine, author of “The Voices of Heaven,” met with Irvine residents in the fifth-floor offices of Seoul Selection Publishing for a book signing and discussion. Her novel tells the story of a Korean couple who adopt a girl and use the services of a mistress to bear a male child. They are all subsequently torn apart by war. Who fought: North Korea, supported by China and the Soviet Union; South Korea, supported by the United Nations, with heavy involvement of the U.S.
“This is a story about the common people of Korea, and the record of their having lived through the Korean War and its aftermath,” said Devine, a Korean-born writer and teacher who lives in Kansas City, Mo. “They go through the trials and heartaches of the Korean War, and that Korean War situation still holds relevance to today’s situation because of recent developments.” Those developments include the revoking last month of a 60-year-old armistice by North Korean Supreme Leader Kim Jong Un, and an increase of bellicose threats by Kim. Those threats have been matched by the U.S. with military exercises and warnings of dire consequences if war breaks out. Choo is referring to a pattern of threatening rhetoric by North Korea, followed by negotiations with South Korea and the U.S. and some concessions of aid. North Korea, officially a socialist republic, is one of the most isolated countries in the world, yet is also one of the most heavily militarized. A known nuclear weapons state, North Korea also suffers from widespread famine, according to many reports. Devine said she hopes readers of her book will understand Korean culture better, in “all its sensuality as well as its values.” “I want them to come away with the feeling that the characters, no matter how difficult their situations were, they try to live honorably, according to the values given to them by heaven,” she said. Devine is married to Michael J. Devine, director of the Harry S. Truman Presidential Library in Independence, Mo. Her novel is available on amazon.com and through Ingram Publisher Services. Published: April 7, 2013 Updated: April 8, 2013 4:28 p.m.
Korean American author Maija Rhee Devine talks with Irvine residents about Korean War and current tensions. 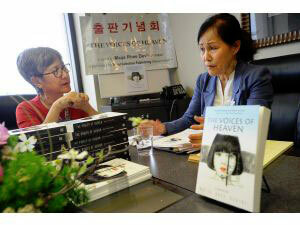 Author Maija Rhee Devine, right, speaks about her book “The Voices of Heaven” as Brenda Paik Sunno listens during a book reading and signing at Seoul Selection Publishing in Irvine on Sunday. 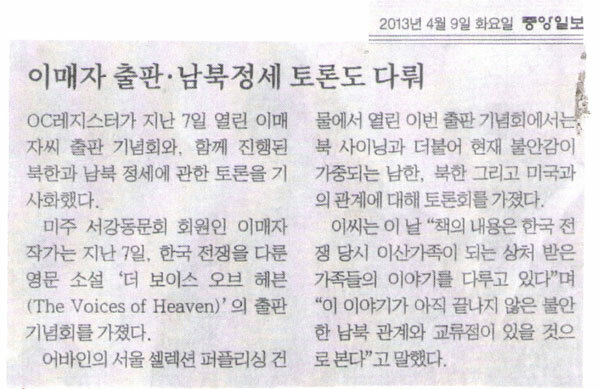 “The Voices of Heaven” is a love story set during the Korean War.